You have probably noticed a new feature for Facebook Page administrators that becomes visible when you update your status. It’s called Promoted Posts and it’s causing quite a bit of controversy among page owners. But first, what is it and how does it work? Previously, when you updated your status, your post would appear on the wall of your fans based on an algorithm determined by Facebook. 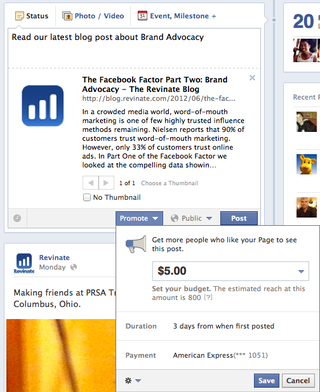 Now, Facebook allows you to reach more of your fans by paying for additional exposure. In addition, when your fans engage with your post, their engagement will appear on their friends’ news feeds as sponsored ads. (Previously, sponsored storied appeared in the right-hand column.) And, of course, Facebook provides analytics to see how your posts performed. Why is this new ad-type controversial? Many people feel like Facebook is double-dipping. Companies have been advertising on Facebook for years to build up their fan-base so when they have news to share, it will be shared with their fans. Now, Facebook is making brands pay again to ensure that news gets seen by the most amount of fans. What do you think? Is this new ad-type good for businesses? Will you be paying to promote your posts?